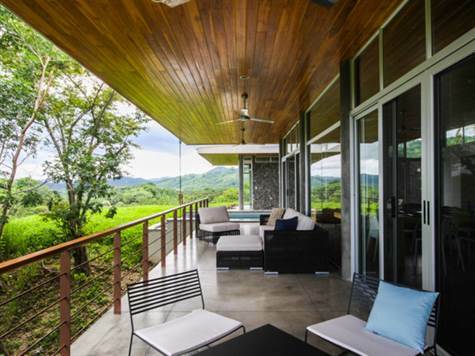 At nearly 4,000 square feet, this residence is located in The Colony at Nosara. The master-handcrafted tropical hardwood entry door opens to reveal the amazing blend of indoor/outdoor living space separated only by floor-to-ceiling glass windows and aluminum sliding doors. The spacious modern kitchen sporting high-end appliances and granite countertops overlooks the roomy dining area. Modern tropical designs with an Japanese hint and Costa Rican accents, Exquisite landscaping bringing a jungle paradise feel to your front door, Polished concrete floors in both indoor and outdoor living spaces.